Will this dorm room tin sign encourage you to eat more fruit? OK, somehow we don't think that's its purpose. 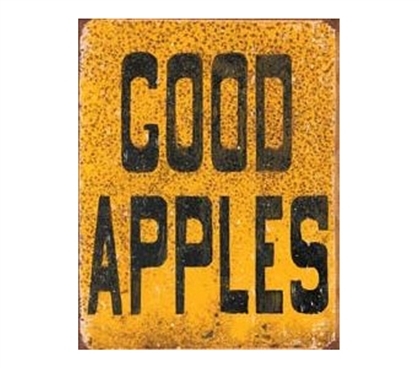 Yet you'll want to add college decor items like this Good Apples Tin Sign to ensure that your living space looks the best it can. Cool dorm stuff and supplies for college like cheap tin signs can do wonders for decorating your dorm. You can even base entire dorm decorating ideas around college tin signs. So, if they're not a part of your dorm shopping checklist, make sure that they are now. Plus, no matter where you end up living next year, there's no stopping bringing your college dorm tin signs along to add to your college decor, whether you're living in another dorm room or not.